U.S. Embassy in Bangladesh published New job vacancy Notice at bd.usembassy.gov. US Embassy job circular offer some New vacancy in this post. Graduate Completed student can apply this US Embassy Vacancy Notice 2019. You have to complete your US Embassy online application before the job deadline we mention below this post. U.S. Embassy in Bangladesh Job Notice, Embassy dhaka appointment updates published by www.bd.usembassy.gov . When US Embassy official website published New Recruitment notice then you can also check that updates at ejobscircular.com . Bangladesh Govt jobs & International Jobs Vacancy notice and apply information available here. 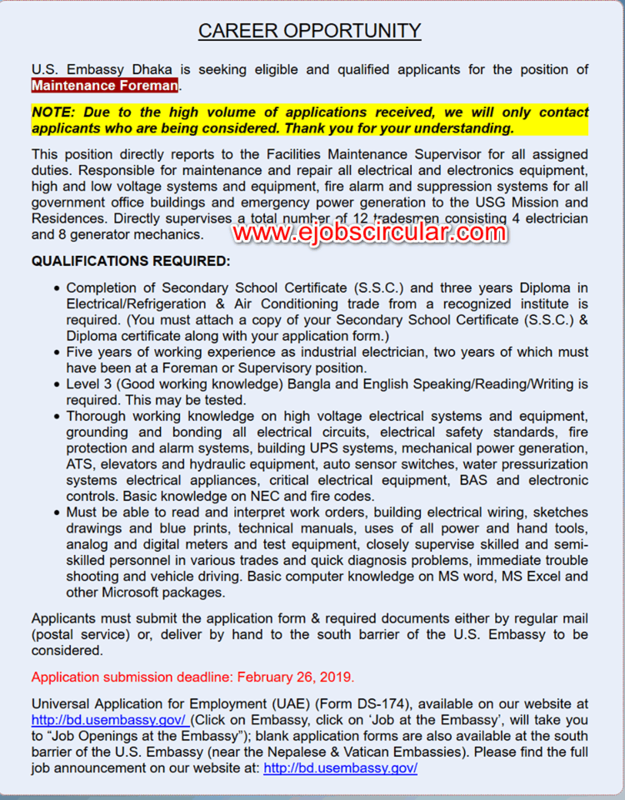 Let`s Check below US Embassy Job Information in February 2019. Three years of progressively responsible experience in communications work, including developing and implementing electronic and social media communications platforms. The incumbent must assess information about all aspects of U.S.-Bangladesh cooperation and transform complex points into effective social media messages. The incumbent must possess a highly developed analytical ability and – especially – excellent judgment so that s/he can decide whether and how to craft USG social media messages about current political events. Also, s/he must have highly developed analytic skills to author the daily social media analysis that goes out to all Bangladesh watches at the Mission and in Washington. Solid computer skills, including video and audio editing, and a familiarity with social media technology. This entry was posted in bd jobs today, Graduate Jobs, international jobs and tagged Bangladesh US Embassy Career Opportunity, www.bd.usembassy.gov by ejobscircular. Bookmark the permalink.